George W. Bush waves goodbye as he leaves for the Summit of the Americas in Quebec, Canada. HMX-1 was established in December 1947 as an experimental unit to test and evaluate helicopters and tactics. HMX-1 provides all helicopter transportation for the President both overseas and within the continental United States. In addition, HMX-1 provides helicopter transportation for the Vice President, members of the President's Cabinet, and foreign dignitaries as directed by the White House Military Office. HMX-1 also provides helicopter emergency evacuation and other support as directed by the Commandant of the Marine Corps. 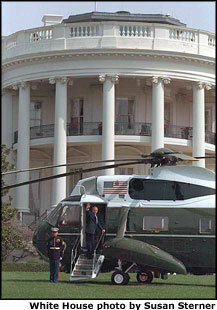 Marine One is the call sign used when the President is on board one of the HMX-1 Marine helicopters. The primary presidential helicopter is the Sikorsky VH-3D (Sea King). HMX-1 is tasked with the Operational Test and Evaluation of US Marine Corps assault helicopters and related equipment.